One of the keys to understanding flood risk is understanding the nuances of the type (or types) of flood you face. Why? A flood’s a flood, right? Wrong. There are several different kinds of flood, and each one bears a different impact in terms of how it occurs, the damage it causes, and how it is forecasted. Here’s a crash course on three common types of flood to help you better assess your risk. A coastal flood, as the name suggests, occurs in areas that lie on the coast of a sea, ocean, or other large body of open water. It is typically the result of extreme tidal conditions caused by severe weather. Storm surge — produced when high winds from hurricanes and other storms push water onshore — is the leading cause of coastal flooding and often the greatest threat associated with a tropical storm. In this type of flood, water overwhelms low-lying land and often causes devastating loss of life and property. Minor: A slight amount of beach erosion will occur but no major damage is expected. Moderate: A fair amount of beach erosion will occur as well as damage to some homes and businesses. Major: Serious threat to life and property. Large-scale beach erosion will occur, numerous roads will be flooded, and many structures will be damaged. Citizens should review safety precautions and prepare to evacuate if necessary. Coastal flooding caused by Hurricane Sandy ravaged the Jersey Shore in October 2012. The severity of a coastal flood is determined by several factors, including the strength, size, speed, and direction of the storm. The onshore and offshore topography also plays an important role. 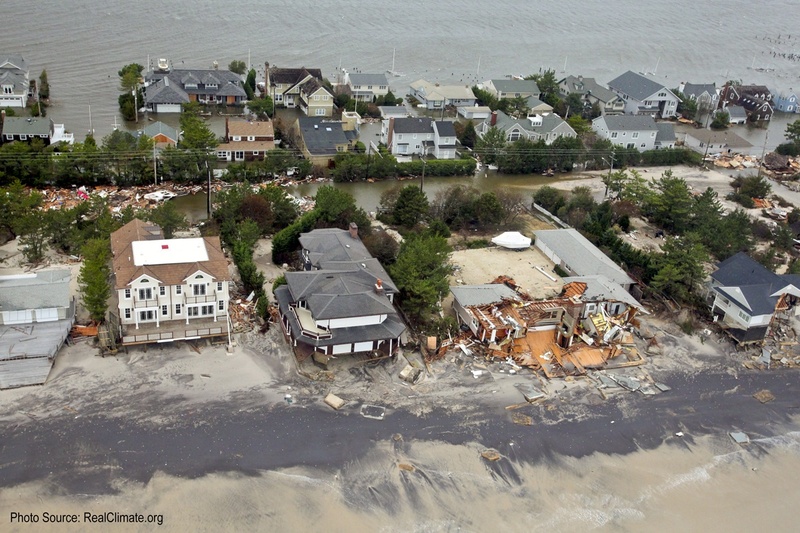 To determine the probability and magnitude of a storm surge, coastal flood models consider this information in addition to data from historical storms that have affected the area, as well as the density of nearby development. Fluvial, or riverine flooding, occurs when excessive rainfall over an extended period of time causes a river to exceed its capacity. It can also be caused by heavy snow melt and ice jams. The damage from a river flood can be widespread as the overflow affects smaller rivers downstream, often causing dams and dikes to break and swamp nearby areas. Overbank flooding occurs when water rises overflows over the edges of a river or stream. This is the most common and can occur in any size channel — from small streams to huge rivers. Flash flooding is characterized by an intense, high velocity torrent of water that occurs in an existing river channel with little to no notice. Flash floods are very dangerous and destructive not only because of the force of the water, but also the hurtling debris that is often swept up in the flow. 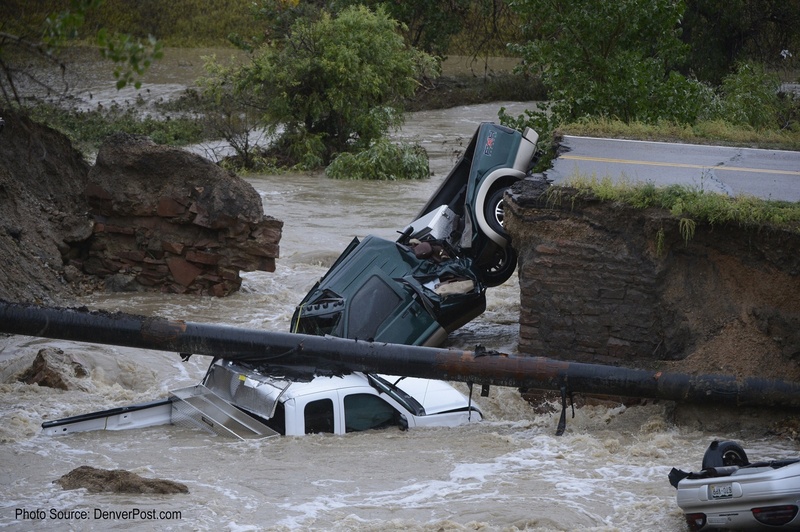 In September 2013, heavy rain caused catastrophic river flooding along Colorado's Front Range. The severity of a river flood is determined by the amount of precipitation in an area, how long it takes for precipitation to accumulate, previous saturation of local soils, and the terrain surrounding the river system. In flatter areas, floodwater tends to rise more slowly and be more shallow, and it often remains for days. In hilly or mountainous areas, floods can occur within minutes after a heavy rain. To determine the probability of river flooding, models consider past precipitation, forecasted precipitation, current river levels, and temperatures. A pluvial, or surface water flood, is caused when heavy rainfall creates a flood event independent of an overflowing water body. One of the most common misconceptions about flood risk is that one must be located near a body of water to be at risk. Pluvial flooding debunks that myth, as it can happen in any urban area — even higher elevation areas that lie above coastal and river floodplains. Intense rain saturates an urban drainage system. The system becomes overwhelmed and water flows out into streets and nearby structures. Run-off or flowing water from rain falling on hillsides that are unable to absorb the water. Hillsides with recent forest fires are notorious sources of pluvial floods, as are suburban communities on hillsides. 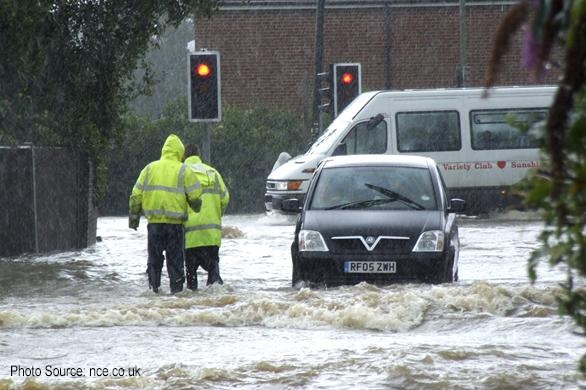 Torrential rain caused extensive pluvial flooding in the United Kingdom during the summer of 2007. Pluvial flooding often occurs in combination with coastal and fluvial flooding, and although typically only a few centimeters deep, a pluvial flood can cause significant property damage. Climate change models predict that severe weather will continue to intensify in the decades to come. At the same time, the world population continues to grow, bringing an increase in urban development. Therefore increased awareness of flood risk, along with better information and tools to help assess it, is critical to prevent devastating loss of life and property worldwide. Want to learn more about assessing flood risk?  Download my free guide below.